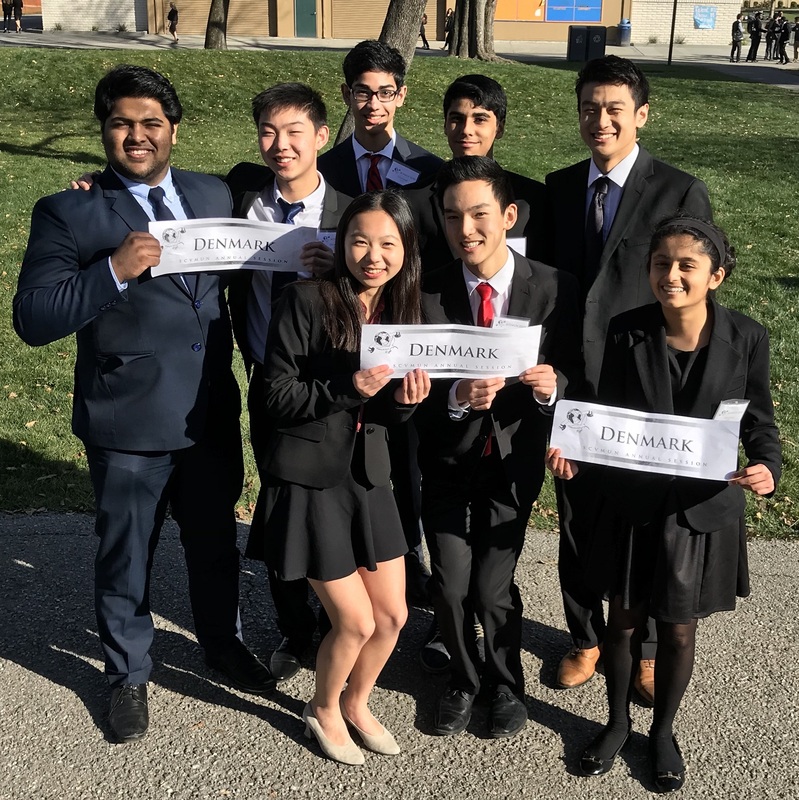 Nine Harker upper school students stepped into the shoes of diplomats as they represented Denmark this past weekend at the Santa Clara Valley Model United Nations Conference, held at Santa Teresa High School. The students debated everything from “Establishing a Legal Framework for the Use of Military Drones” to “Promoting Sustainable Development in Urban Areas​” with students from around the country representing different member countries of the United Nations. While not considered a competitive debate event, students can receive recognition for outstanding research as well as diplomatic engagement in both formal and informal debates. All nine Harker students were recognized for their contributions to their committees, a notable achievement considering the strength of participation at the conference. Sophomores Sriya Prathuri and Jai Bahri were named outstanding delegation for their work in the Disarmament and International Security Committee. Sophomores Bryan Wang and Alyssa Huang were named outstanding delegation in the Economic and Social Council. Junior Ayush Vyas and freshman Andrew Lu received the research award for their work in the World Health Organization, as well as an honorable mention for overall conference engagement. Junior Logan Bhamidipaty, sophomore Jeffrey Liu, and senior Amy Dunphy received an honorable mention in the Legal Committee.